The Great Smoky Mountains Railroad will take you on a journey through the Carolina Mountains and some of the most beautiful landscapes in America. The Carolina Mountains border the entire western edge of North Carolina, comprising some 52 percent of the Great Smoky Mountains National Park. The region also includes the southern crest of the Blue Ridge Mountains, Pisgah, Cherokee, and Nantahala National Forests. Hundreds of years ago, glacial and volcanic movement left etchings still visible on the land. In more recent times, roads and flood controls have opened the area to commerce and tourism. Early in the 20th century, the railway played a major part of the story of the development of the region. With 53 miles of track, two tunnels and 25 bridges, the Great Smoky Mountains Railroad (GSMR) will take you on a memorable journey through a remote and beautiful corner of North Carolina. Ride with us into river gorges, across valleys and through tunnels carved out of majestic mountains.The Railroad offers a variety of scenic, round-trip excursions departing from Bryson City. Trips range from 3 ½ hours to a full day of fun and adventure. Our most popular scenic excursion is the Nantahala Gorge excursion. This route carries you 44 miles to the Nantahala Gorge and back again. Travel the Little Tennessee and Nantahala Rivers across Fontana Lake and into the magic of the Nantahala Gorge. A scenic route displaying the farmlands with a local feel is the Tuckasegee River excursion. This route travels 32-mile roundtrip along the Tuckasegee River through old railroad towns and scenic meadows! We are located in the heart of Bryson City, North Carolina. This delightful mountain vacationland is like a nature conservancy in which small towns, rushing rivers, and ancient mountains reside. 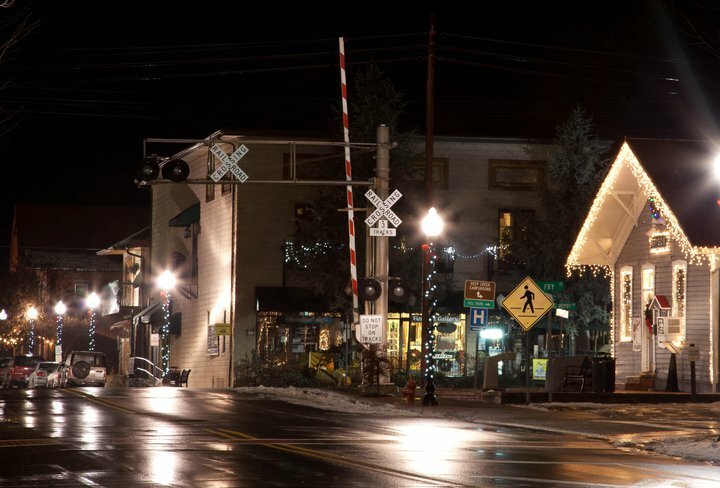 Railroad depots are located in three historic towns; Dillsboro (no current departures), a village of shops and crafts; Bryson City, located on the edge of the Great Smoky Mountains National Park; and Andrews (no current departures), a scenic valley in the Snowbird Mountains. All were founded in the 1800s and have retained some of their original character, adding to their historic charm. Hello, My husband is a Steam man from Ohio. He rebuilds srteam traction engines and has done work on #765 for the Ft. Wayne historical organization . Please send us any info re. the rebuild of your steam locomotive, I’m sure he would be very interested. He also has a fully equipped machine shop able to do work on most steam related projects. If we visited would he be able to see your shop and current projects ? He knows pretty much everything to do with steam related equipment, and would love to meet new like minded steam people. Hi Lexi! Thanks for the comment. The best way to get the most up to date info is to follow this blog and to follow us on Facebook. The shop is currently closed to the public but we are sure if you visited here at the Railroad you would encouter lots of other steam fans! After reading the update on the steam locomotive rebuild, I would like to be sent the application information for the bids you are taking for the work to be done on the locomotive. My husband is highly qualified to do the machine work, and has all the equipment to do it . We are going to relocate to that area of NC in the near future and I know he would love to be involved in another steam locomotive rebuild. If you can, please e mail me a contact person to call in this regaurd . Hi Lexi! Thanks for your interest. We are currently not seeking any new employees for the steam rebuild. Best of luck with your relocation and we hope you join us for a ride! We wish to bring our 12 year old grandson & his service dog to ride the railroad. He has always loved trains & is educated on them. We live in Destin Fl. Is 722 still going to be restored?. And is she going to be green? At this time there are no plans to restore the 722. We are focusing on the 1702 and Turntable projects. I have waited 10 years to ride the Great Smoky Mountain for the 1702 or 722. Maybe now I can finally go ride it. I live in SC but for a train ride usually go to Colorado or Tennessee, now one will be closer to home. I hope 1702 will have the silver smokebox and glossy black paint. I also hope 722 will someday return to the rails too, it would look superb with 1702. My request is paint 722 green and gold (1970s style) with the aluminum smokebox. When will 1702 be fully restored? She will not be ready to go until Summer of 2016! Things are moving ahead nicely!